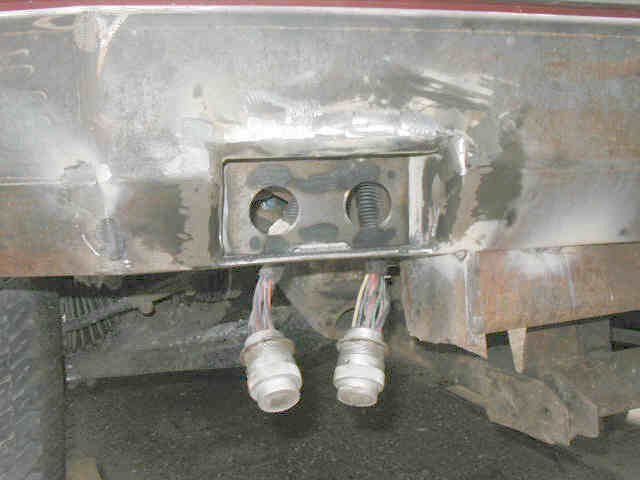 "I haven't blended any of the welds yet, things are still looking pretty crude. I had the raw stock bent to get the profile, then I notched and bent the various angles to make the center and ends where I wanted them. It took a while with angle gauges and straightedge to get both ends to match. They're still not perfect but not readily apparent to the naked eye." "I just set the top plates on for the pictures. The welds still need to be ground flush and something rigged across the main supports to stiffen the diamond plate. The dp is 1/8" stock and should make a nice place to stand when working under the hood. I think you can tell by the pictures that it's full sun out there today, not a hint of haze to dull the sun. 82� and climbing so I'm NOT working on it until the sun goes down a little. The only place I have to work is a slot between two structures so there isn't even much breeze. I'd kill for a decent garage where I could get inside, out of the sun and with a fan going I could actually accomplish something." Got after the bumper again today. 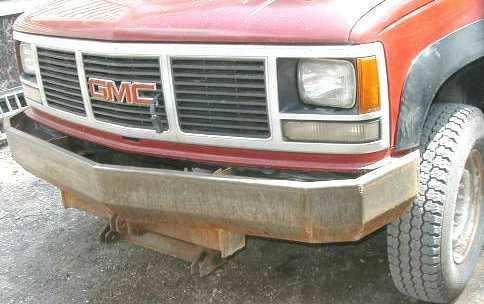 I've been working on bumper braces the past couple evenings and finally bolted them in last night. The braces are 2" channel and had to be flared where they attached to the cab mounts so they could catch both factory bolt holes. I split the web next to one flange, spread the flange away and then welded in a "wedge" of plate. They also had to be bent (the easy way) with the flanges out. 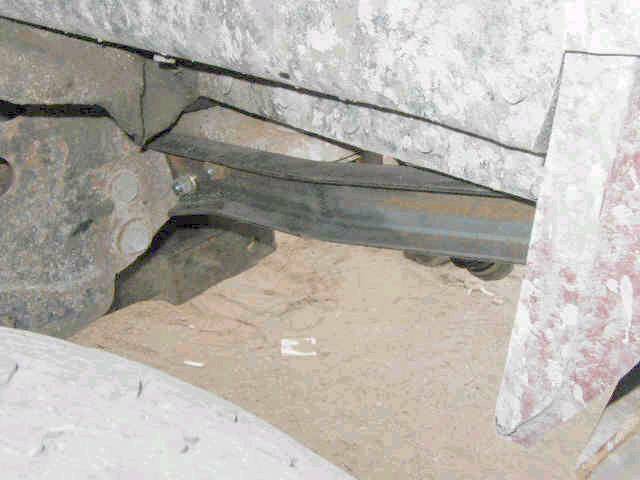 If you look real close you can see where the channel was flared down near the truck frame and the slight forward bend in the brace. 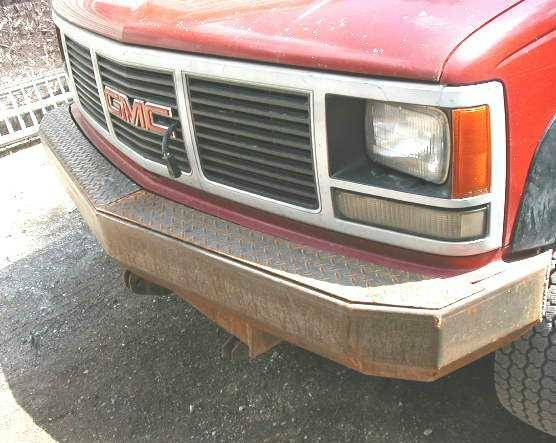 If somebody slaps a corner of THIS bumper they are going to find that it slaps back, HARD! I wanted to recess the plugs for the Sno-Way vee plow so they would not be so likely to get wiped off. I cut in this "picture frame" to accomplish that. It doesn't show here but the top and sides of the opening are radiused. I did that with split sections of 1" Sch. 80 pipe. 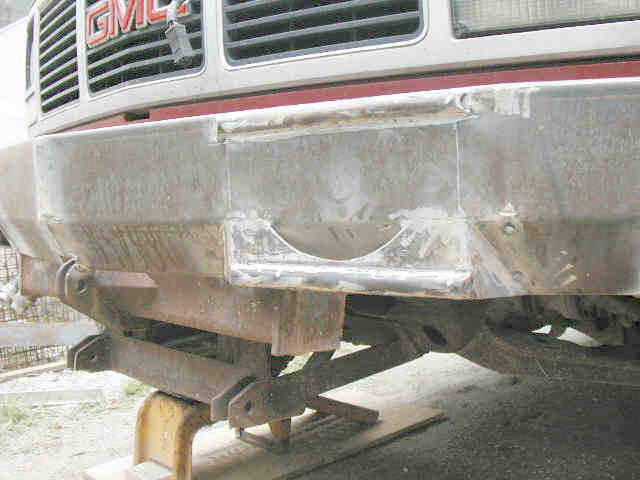 Wall thickness is right around 3/16" so it matched the bumper itself as well as the plate I used for the sides. The back plate is 1/8" and a 1 3/4" hole saw made short work of the holes for the plugs. You can see some heat bluing around the holes where I welded 1/4" square stock to trap the flats on the back of the plow plugs. This was necessary as there is no way to access the rear flange of the plug to hold them when they are tightened in place. 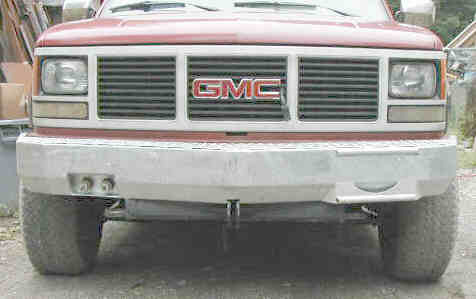 There is a slight gap at the bottom of the rear plate to allow water to drain as the bottom tilts slightly to the rear. I relocated the registration tag to the left side of center. I had visions of slipping off anf the tag acting just like a scraper on my shin. I added sectioned 3/4" pipe rails above and below where the tag will bolt up. These will protect the tag as well as my shins. In the process of all this stuff I blended (rough) al the exposed welds. They still need to be hit with sanding disc or flap wheels to smooth them in. Next week both bumpers and the headache rack are going in the galvanizing kettle. When any post fabrication galvanizing is to be done it is important to get the finish you want on the parts before they get dipped. Any pits or voids in the weld will show in the finish. Even worse is that if there is any welding slag not removed it will remain through the galvanizing process and eventually rust will form under the contamination. All photos and text �2003 Alan Nadeau, All rights reserved. Used with Permission.